I worked on some cards this week. I am not going to explain them all....they're not difficult to do. If you have any specific questions about technique/stamp set, let me know. I had a set of stamps that I'd hardly ever used with these small sayings on them. I was trying different ways to incorporate them into my cards. The set is Cute Converse. It's on the last three of the cards. Here's my friend Tiffany's wedding gift! I've not mailed it yet....so I hope she doesn't check this site! 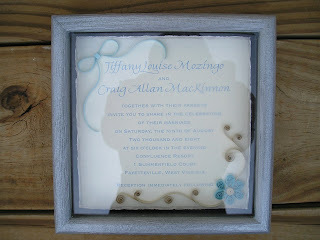 I did some quilling on her invitation, matching the blue on the invitation and adding a creamy base color for the swirls and framed it! I hope she likes it! I've never done that bow on top before, and it posed a little challenge, but I like it and think I'll do it again!